Daniel Grewal, Tracey Booth and Abi Roper from the School of Mathematics, Computer Science & Engineering, take top honours in the second edition of the competition which brings out the best in student innovation, creativity and use of technology. Organised to coincide with London Technology Week, City University London's Made@City 2014 exhibition and competition took place on 17th June at the Shoreditch Village Hall in Hoxton Square. The second edition of Made@City was also a celebration of the work of final year undergraduate and postgraduate students in the School of Mathematics, Computer Science & Engineering, particularly those demonstrating excellence in innovation, creativity and the best use of technology. The winner of the best final year project was Daniel Grewal (BSc Software Engineering) whose work predicts sports results using Naïve Bayes Classification and Time Series Analysis. 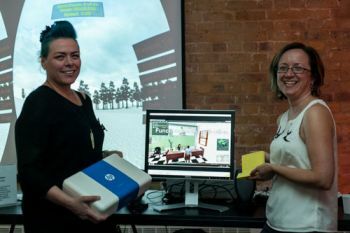 Research students Tracey Booth and Abi Roper won the prize for best overall project and the inaugural Made@City 2014 Peoples Prize, for 'EVA Park', a tailor-made virtual world which assists in developing the communications skills of people suffering from aphasia. A joint project between the School of Health Sciences and the School of Mathematics, Computer Science & Engineering, the project is funded by the Stroke Association with the grant held by Jane Marshall, Stephanie Wilson and Celia Woolf. "Made@City 2014 was an awesome demonstration of the creativity, technical savvy and entrepreneurial zeal of City students. 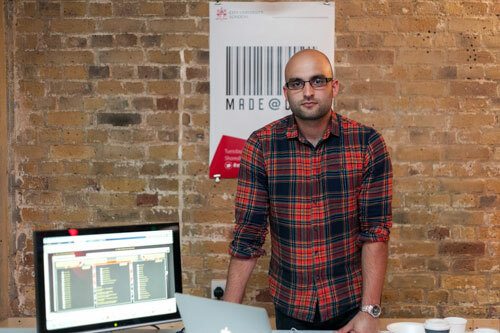 We are delighted with the buzz they created at Shoreditch Village Hall during London Technology Week. The winners can be proud of themselves for coming up with such innovative projects which have already attracted the positive attention of investors attending the event. Made@City has proven to be an invaluable aspect of the overall education experience offered at City." Thirty students exhibited their projects and over 200 attendees visited the event, including potential investors, staff and students from across City. To read Tech City Insider's coverage of Made@City 2014 (including audio interviews), please visit this link.